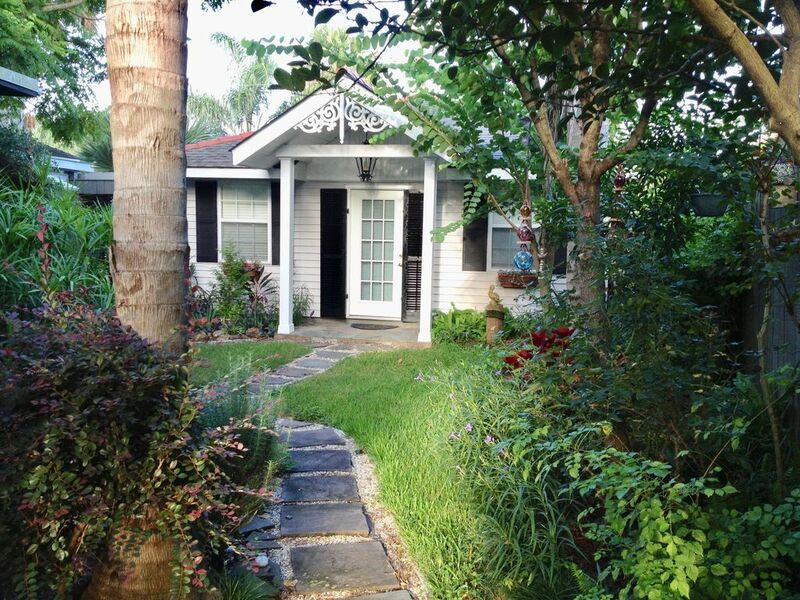 The cottage is located behind our Vieux Carre style home. Upon your arrival you can relax and plan your New Orleans visit in your cozy cottage and private patio. Enjoy a welcome wine basket with local delicacies. The Cottage is located in one of the nicest residential sections of New Orleans. It is a quiet neighborhood away from the crowds and noise, and very convenient to City Park and the New Orleans Museum of Arts, the Besthoff Garden and the New Bayou Oaks 18 hole golf course. You are centrally located to the best of the City within walking distance to Lake Pontchartrain and an inexpensive Uber ride or public transportation to the French Quarter..
Coffee shops, wine bars, Seafood, Mexican, Asian and Creole restaurants are very close; or, relax and barbecue on your private deck. Grocery stores are minutes away. But, don't rush - we have provided basic breakfast items (fruit juice, coffee, milk, cereal, yogurt, bread and butter) for your first morning leisure enjoyment. The inside of the Guest Cottage was recently remodeled with hardwood floors in living/dining, new stainless appliances including ice maker refrigerator and granite countertops in kitchen. Separate bedroom with queen size bed and large bath with built-in make up table. Private off street parking, Cable TV, Hi speed wi-fi and washer/dryer in cottage. This is a clean,well supplied cottage for two. The owners thought of everything you need and then added some nice surprises. The owners were friendly, helpful and ready to help with anything. You sure can’t go wrong with this one. I’d recommend this one to anyone. As a native New Orleanian who’s not lived there in over 30 years, I found this the perfect NOLA Sanctuary for relaxing after outings in and around the City and a perfect location with easy access for getting to all areas. We loved being able to walk the neighborhood, to the Lakefront and to restaurants nearby. Our mornings having coffee outside and evenings winding down were a wonderful start and finish to each day. Your beautiful and true New Orleans style is just what every visitor should experience! Thank you Susan and Eldon! This little cottage was so cozy and comfortable. It's located behind the main house of Susan and Eldin, and they were amazing. They have the most beautiful gardens that you can enjoy and they are right there if you need something, but far enough away to provide privacy. Susan and John have the cottage stocked with everything you need and more- even having a welcome basket of local NOLA snacks, trinkets, and breakfast and appetizer items in the fridge. The house is beautifully decorated and comfortable, including a vase of fresh flowers from the garden. The location is in a beautiful residential area, only 5 - 7 miles from the hustle and bustle of Bourbon Street, The French Quarter, and anything else you may desire to visit. Definitely would recommend this cottage for a visit. Dear Larri: It was a pleasure to have you as guests! Susan & Eldon's cottage is charming - clean and tastefully decorated in New Orleans style. It has everything you need to be comfortable and feel like you are 'at home '. We totally enjoyed our 2 month stay in this adorable cottage. It was just perfect! We booked again! We highly recommend this cozy, cute and bright cottage and especially loved having our own lovely, private deck where we enjoyed many coffee’s, happy hours and meals. Our hosts were amazing in every way. We loved it! !